I'm a longtime AoE fan and I've always loved creating custom scenarios, mostly for recreational purposes (I find extremely relaxing to just put on some music and design scenarios on my free-time). I've worked with AoE, AoE II and AoM editors, aswell as with Starcraft I & II editors. I believe I've made some decent custom campaigns but I've never really published any of them because I'm not sure they'll meet expectations for everyone. 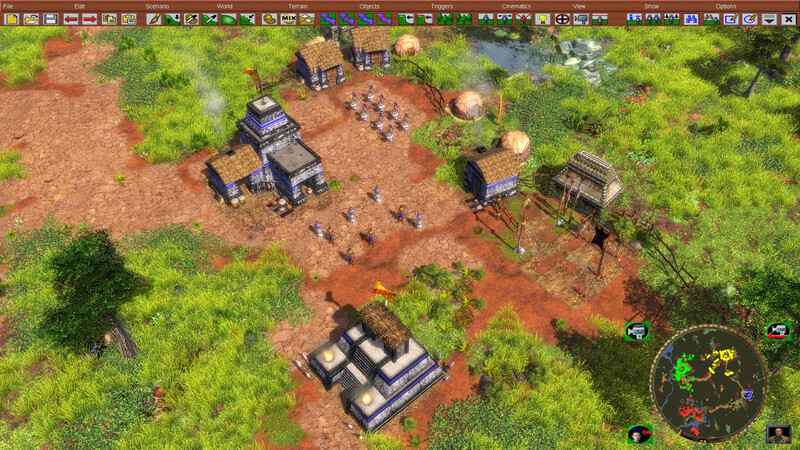 I'm creating this topic because I've decided to recreate (with my own design approach of course) the Aztec campaign (Moctezuma) from AoE II (The Conquerors) and I need some help in understanding the editor. I've chosen to do it with this mod instead of the vanilla version simply because it's awesome and I love it, but also because it has several other civs and mechanics I could use. 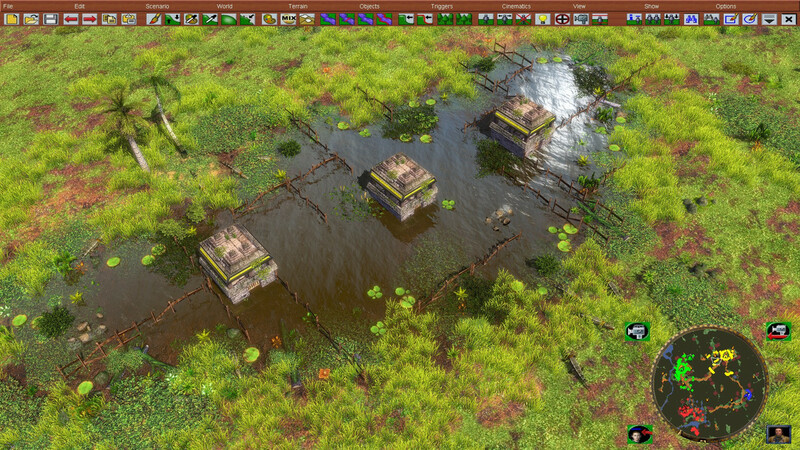 For the first scenario I've already modelled the terrain and placed buildings and units, I've also set up the player data, AI HC, and (via triggers) the starting age and diplomacy. 1. I've seen that the "Set Tech Status" trigger is similar to AoM, but I'm having trouble identifying some techs, specially those needed to prevent computer and human players from advancing more ages. Is there a list or some way I could see the tech name's equivalence between "in-game" and editor? Also on this point, should I block the research for all the politician options (or, is there any "hole Age 3" tech to be blocked) in order to prevent age advancing for the players? 2. Is there a way to prevent players from reaching 200 pop cap (besides forbidding house construction or editing XML's)? Lets say I want the human player to have a max pop cap of 75, is this possible? 3. Is there any "efficient" way of placing underbrushes on large areas of the map? I mean like the forest underbrushes but without the forests, with the forest editor I can reduce the density of the trees but that also reduces the underbrush. 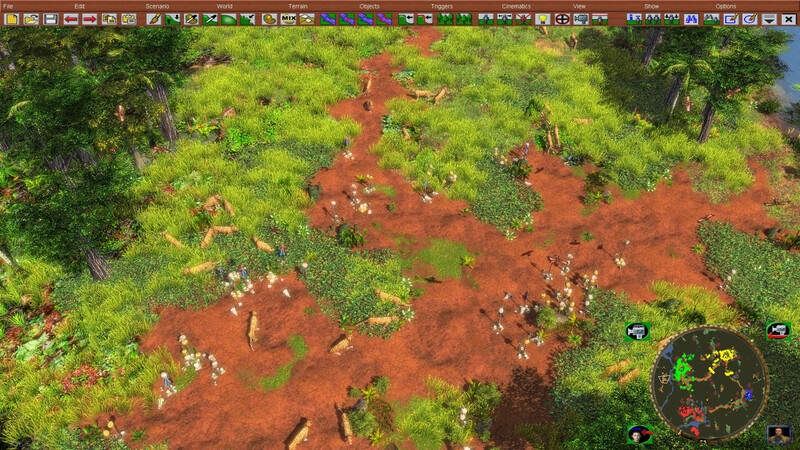 Maybe I could make some "Mixed Terrain" while programming the underbrush in it?? 4. In AoE III's history we've had several scenario editor mods, are any of those compatible or included within this mod? Is there any benefit from using one with this mod or should I avoid them? I think that's all for now, but I'll surely have more questions while making the scenarios and I'll be sure to post them here. I'd also like to apologize if I made some writing mistakes, english isn't my first language. I've got no calendar for delivering the campaign because I make it on my free-time but I could publish it if anyone is interested, I could even use some testers in the future when I have something to test. Oh sweet! WoL actually doesn't have much people who make scenarios with, so it's always great to see posts like yours. 2. That depends. You can change the PopCapAddition of houses. 3. Not really, no. Unless you want a fixed pattern, which is not visually enjoyable . Didn't try it yet, but: you could create custom "forest" in bin\Data (find any forest xml file), draw ingame and then delete the file. 4. Yeah, WoL has the most advanced editor by Reyk, and it's already good enough in my opinion. Unfortunately it'd be complicated to replace it with other editors since there would be UI conflicts. You can place underbrush manually, they exist as objects in the "Place Objects" list. They're all called "Underbrush [Region Name]" of some kind, hopefully you'll find what you need there. I'm also looking for ways to distinguish those tech proto-names in the editor with the in-game techs. The list is quite giant, and a bit of a pain to search through. If the clumpiness or so is 0 in the forest painter, then you have only underbrush IIRC. I know that in the past I've painted forest without texture, so if you don't want to paint texture with the underbrushes, there is must be an option. I think it was a brush option. Awesome! Thank you all for your help, its great to find guys like you willing to help me out and even better that I found you so soon! 1. I'm still a bit of a noob with the mod's files, could you please explain where can I find those xml? 2. But changing this would affect all of the houses, for all players right? Then I guess I can't really restrict population for just one player unless I disable house/town center building right? 4. Great! I haven't really tried all versions, but I'll take your word and use the one that's already shipped with the mod. Yes, that's the way I have been doing it, but its kinda slow, I mean, I can do it this way, I just wanted to know if there was a better way. Yep, I'll give a try to what Alistar said and see. Humm, I was almost certain that I still got forest in anyway i tried, but I'll try both ways to see if anyone works. Thank you!! Finally, I'd like to share some previews, this is the state of the map, obviously I've made several changes but I kept the same layout & general gameplay. My changes are mostly focused on the aestetic theme. I'm still getting to know all of the assets at my disposal in the editor and trying several textures (I haven't found a road texture that I really like) so... this is not final! I hope you like them, and if there's anything you might suggest I'll try to do it as long as it is between the general scope of this project! Last edited by sturzaiz on Tue Mar 26, 2019 6:25 pm, edited 2 times in total. Really? Something is odd, they're showing up for me. Could someone recomend an image hosting site so I can move them there? Edit: I removed some code that made the "image" icon show up as an error. Sorry, still aren't showing for me Might be a problem on my end. 1. Mod files are in [Game installation folder]>Data for data, Art for textures, models and icons (among other art assets), Sounds for musics, voices, ambient effects and UI sounds, AI for Computer Player. 2. To be honest, I am not sure. I will have to try and see. 4. In case you still have The Asian Dynasties without mod, Mister_SCP made an editor with several extra options in the Download Section of Age of Empires III Heaven.